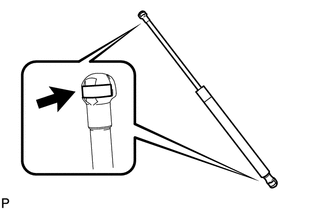 Avoid touching the piston rod as much as possible to prevent foreign matter from attaching to it. Be sure to hold the cylinder while servicing. Do not wear cotton gloves or other similar materials when handling the piston rod. Fibers may attach to the rod and result in gas leaks. Do not apply any horizontal load to the door stay in order to prevent the piston rod from deforming. 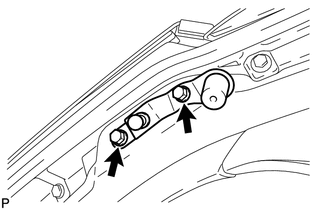 (b) Release the ball joint and remove the back door stay assembly. Remove the back door stay assembly while supporting the back door by hand. (a) Remove the 2 bolts and back door lower damper stay bracket. (a) Remove the 2 bolts and back door upper damper stay bracket. (a) Secure the back door stay assembly horizontally in a vise with the piston rod pulled out. (b) Wear safety glasses. 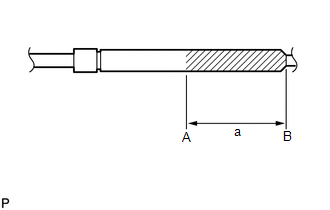 Use a metal saw to slowly cut a groove between A and B shown in the illustration to release the gas. Although the gas inside the back door stay assembly is colorless, odorless and harmless, metal debris may scatter. 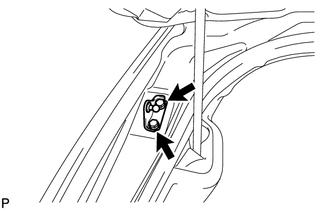 Therefore, cover the back door stay assembly with a piece of cloth or other material. 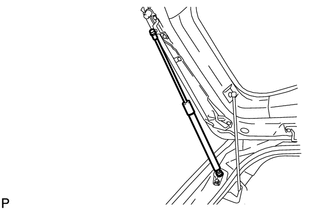 (a) Clean the threaded portion on the vehicle body with a non-residue solvent. 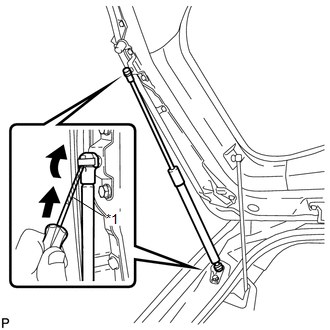 (b) Apply adhesive to the threads of the 2 bolts. (c) Install the back door upper damper stay bracket with the 2 bolts. (c) Install the back door lower damper stay bracket with the 2 bolts. Do not apply any horizontal load to the door stay in order to prevent the rod from deforming. (1) Install the 2 stop rings to the back door stay assembly. (b) Install the back door stay assembly. Install the back door stay assembly while supporting the back door by hand. 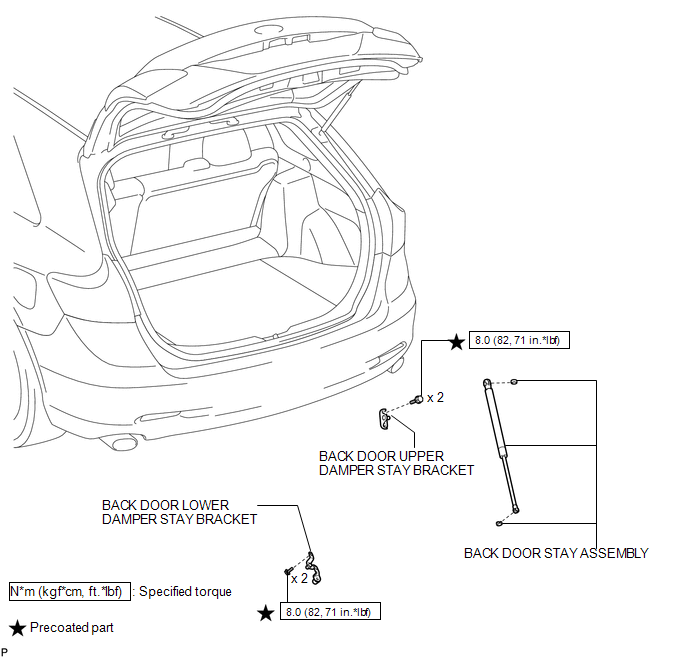 (c) Check that the back door stay assembly is engaged in the ball joint and that the back door stay assembly cannot be pulled out.